This month, hear from the newsmakers behind some of TODAY.com's biggest moments of the year in "2014 Voices," a special series of essays and interviews. 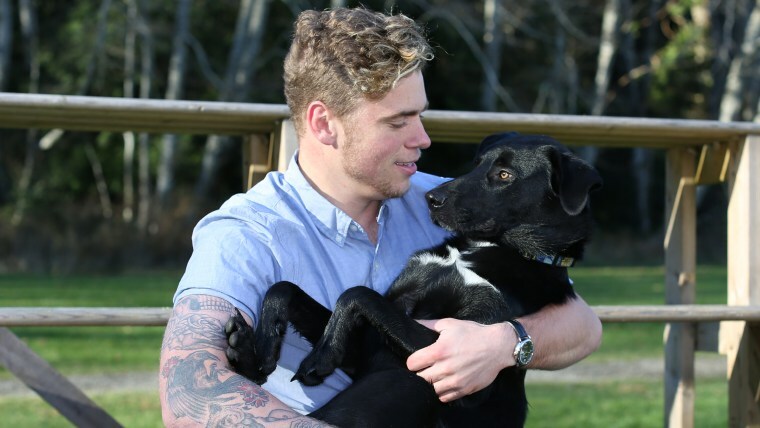 Here, 23-year-old Olympic silver medalist Gus Kenworthy, who lives in Denver, shares an update on the stray dogs he adopted after competing in Sochi, Russia. I wound up adopting two dogs from Sochi. It wasn’t really me who brought them home as much as it was one of my best friends, Robin Macdonald, who was out there with me. Robin went to Sochi to do some media stuff, and support me and some of the other guys he’s friends with. He stuck around almost a month after the Olympics ended, to get everything dealt with, and he flew back with five more dogs. [The dogs] are actually living right now with Robin in Vancouver, British Columbia, because I’m competing and traveling a lot. Earlier this year, when I had to leave a couple times for a couple of obligations, I had to leave the dogs with my brother and sister-in-law; they loved having them, but they have a dog of their own, and they both have busy schedules. It just kind of became a little bit of a burden for me to be pawning them off on people, and I didn’t want to bring them with me everywhere and then not be able to give them proper attention, because I was out on the mountains. Obviously, Robin’s totally attached to them, too, so, we kind of have a joint-custody thing. He’s looking after them for the winner, and after the season, I’ll take them back down to Denver. Of the five dogs Robin brought back, one of them went to a humane society, one was adopted by my mom, and one of them passed away in New York, unfortunately. The dogs were all kind of suffering from distemper [a viral disease that can affect the brain as well as digestive, respiratory and nervous systems]. They’d never been vaccinated, and they never really were in the best condition. They weren’t really getting any medical treatment in Russia — that was the real reason Robin was trying to get them released to him, so he could get them back to the States and get them some proper care. It was kind of a nightmare. So, it was just hard. I think distemper is king of a lifelong thing, so, once you have it, the dog’s immune system is going to fight it, but it’s never truly gone. I’m always on the lookout to see if anything happens, or if there’s any weird neurological stuff. My two dogs are Jake and Mishka. They’re total mutts, and both boys. We don’t know exactly how old they are, but they’re about 11 months old. They’re mostly German Shepherd, and part Siberian husky, bloodhound, Doberman…They've just got a little bit of everything in them. They’re awesome dogs. [My two dogs] are completely different from one another. They’re both very affectionate, but Jake is definitely more independent. He does his own thing. He’ll pick through a basket of toys to find what he likes. And Mishka? He wants whatever toy Jake has. If you’re sitting down and go to the kitchen, Mishka gets up and follows you. If you get up to go to the bathroom, he goes and lies down by the door. If you do anything, he’s right there. We call him Shadow sometimes, because he’s right there, behind you. But they’re cute. They’re very affectionate. They’ve very close with each other. They nap together, curled up. They eat together and play together. They’re attached, for sure. I didn’t really expect to be an advocate [for rescue dogs]. My family’s dog, when I was growing up, was an adopted dog that I got, in a shelter, for my birthday. I’ve always felt really strongly about adopting animals, and trying to save animals’ lives. There are so many animals, in shelters, that need homes. Rather than going to a breeder and buying a dog or a puppy mill or anything like that, I’ve always been a big fan of adoption. I’ve worked with PetCo [on advocacy for this cause]. They had a Dog Days of Summer event in San Diego, where, at one of the Padres’ baseball games, a bunch of shelter dogs were available for adoption, and they walked the field before the game. I threw the ceremonial first pitch, and they did a little announcement about the dogs that were available. There were a lot of dogs that were adopted that day, and a lot of money raised. I did the same thing for PetCo in New York. I’ve also worked with Humane Society International. [After the Sochi Olympics] I kind of took the summer off. I just kind of hung out and took care of the puppies. There was potty training, getting them healthy and hanging out with them. I needed a little bit of a break from skiing. I just kind of felt burned out after a really stressful, emotional year. I hung out with the dogs and didn’t really ski too much. I recently dropped them off there with Robin, and then I’ve been back a couple of times just to see them again and hang out. It’s been pretty mellow. Now, skiing is back in season, and I’m in competition. So, I’m very much back in the swing of things. As for the 2018 Olympics, I certainly hope to compete. That’s the plan, but easier said than done, because that’s four years away. It’ll be hard, but if I’m healthy, I think I’ve got a really good shot. As told to TODAY.com's Chris Serico. Find more of TODAY.com's "2014 Voices" here.